It tooks its time - so was it worth the wait? The Majini, virally mutated natives who make up the bulk of the game's enemies, are hardly light years from the previous game's Ganados. Run-of-the-mill infected townsfolk will attack you with spades, pitchforks, primitive crossbows, sticks of dynamite, sickles and, if necessary, their bare hands. They have much the same bestial cunning and physical capabilities as their Spanish forebears, too: duck into a building and they'll come hammering at doors and windows, shoot one in the leg and he'll crumple realistically floorward. Later on the game introduces infected tribesmen, some armed with shields - you might take out their feet with a burst of pistol fire, or blow the barrier apart with your shotgun. 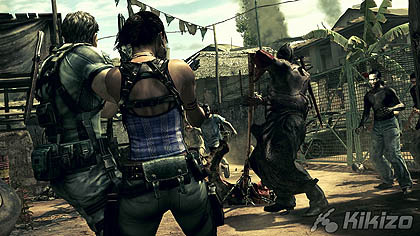 It could be suggested, with some justification, that Resident Evil 4's enemies were way ahead of their time, that Capcom shouldn't fix what ain't broke, but there are definitely rustier bits - despite their obvious un-zombie-like intelligence, some Majini are content to approach at a stroll as you gradually plug their orifices with iron. Some players may wince when they run into "special forces" in the final two chapters, indistinguishable from Syphon Filter's paramilitaries behind their riot shields, and slam the developer for betraying Resident Evil's' survival horror roots. 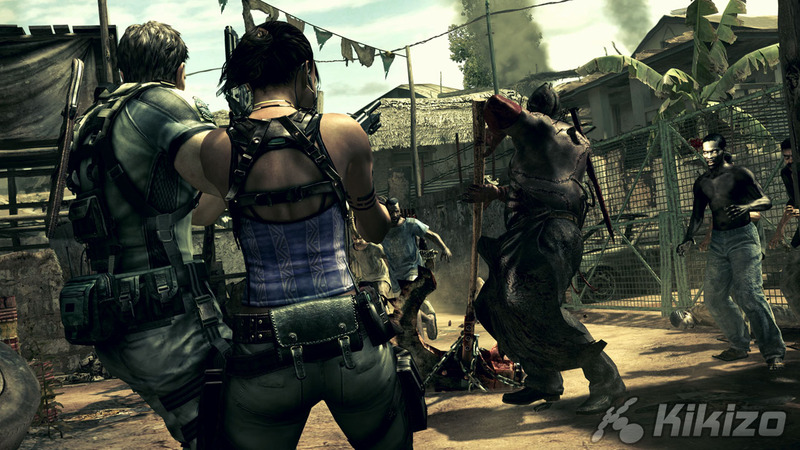 But it's hard not to admire the way Resident Evil 5 sneaks into Tom Clancy's backyard without sacrificing its integrity. At far-flung intervals you can context-sensitively press your back to a handful of convenient cover points, peek-shooting at the snipers. You might call it a cheap homage to a popular Western convention, or rejoice that Capcom has managed to borrow elements from strikingly dissimilar games without trashing its own. 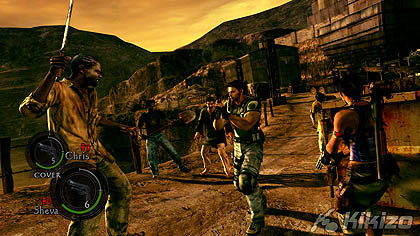 Resident Evil 5 doles out a liberal portion of button prompt sequences - twiddling the stick to throw off a suffocating tentacle, hitting square to hook punch a staggering Majini, clenching the shoulder buttons to roll under the lunge of a ferocious crocodile - and does so elegantly and (more importantly) logically enough to thwart the usual "interactive-movie" protestations. Again, the Marmite logic applies. You might dismiss the numerous boss fights as so many variations on the theme "Shoot The Light-Coloured Bits To Expose The Weak Point", or let the sheer, tentacled, many-fanged magnitude of the beasts you encounter overpower any reservations about how you're required to destroy them. Boss battles and inhuman hordes aside, there are rail-shooting sequences, a dash of powerboat driving and some environmental challenges to round out the 8-10 hour story, Some of these, the series of Tomb Raider-ish light beam puzzles halfway through being first and foremost, are miserably derivative, but muddle through and you'll discover some delightful set pieces towards the finale: bouts of sharpshooting atop a spinning elevator, or a running battle aboard an industrial conveyor belt stuffed with exploding gas tanks, a furnace at your back and Majini wielding electric truncheons up ahead. You'll have to judge for yourself whether the latter are sufficient compensation for the former.